Changing Gears reporter Kate Davidson last week debunked the conventional wisdom that Detroit has 40 square miles of vacant land. In her report she found that in all likelihood the number is probably closer to half that. Which, if you think about it, is still a lot of empty land. Which is where the Detroit Works Project comes in -- that's the name of Mayor Dave Bing's revitalization plan for the city. The Detroit Works team has to figure out what to do with all that empty land. To help them find some answers, they're turning to Detroit's residents for help. They're also enlisting the help of ... a table. Yes. But this is no ordinary table, dear reader. The purpose of this particular table is to "disrupt people’s everyday lives," according to Theresa Skora, who helped design it. "It’s meant to fold up and be put into a car and be taken around," says Skora. Which is why they call it the Roaming Table. 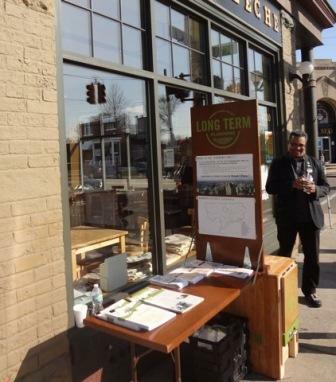 And believe it or not this table – with its nifty green logo and stacks of glossy pamphlets – is key to the city's revitalization plan aka Detroit Works. Detroit Works has two parts: a short term plan and a long term plan. The Mayor’s office deals with the short term plan: the vacant houses, unlit sidewalks, flooded streets. A separate committee outside the Mayor’s office is in charge of the Detroit Works Long Term plan, which is tasked with trying to figure out what happens after the abandoned houses have been dealt with and the streetlights have been turned back on. We want to find out what each neighborhood needs, says Long Term planner Charles Cross. "What is the quality of life in your neighborhood, and what's missing?" And since it’s impossible to sit down with all 700,000 Detroit residents at their kitchen tables, Cross and company did the next best thing and built a kitchen table that travels. The Roaming Table has been popping up all over the city. It's been spotted outside banks and churches and community centers around Detroit. About 5,000 people have stopped by over the past few months. Some fill out surveys about their neighborhoods and drop their responses in the table's built-in ballot box, others just take home literature about Detroit Works and promise to read it later. And then there are folks like southwest Detroit resident Johnny Espino who hang around and ask the urban planners behind the table questions most people are too shy to ask. Questions like: Do you really think you're going to be effective? What are your goals? What’s your honest opinion of everything? Dan Pitera, director of the Detroit Collective Design Center, is leading the civic engagement part of Detroit Works. He says Detroiters have a serious case of planning fatigue, and with good reason. There's a long history of groups swooping in with the latest and greatest plan to "Save Detroit!" only to have the plans languish half-way through or never even get off the ground. But Pitera and crew insist their plan is different. They say it’s not just urban planners and designers who will decide what the Brightmoor neighborhood will look like in 5 years, or what neighborhoods in southwest Detroit will looks like in 10 years. They promise Brightmoor residents and southwest Detroit residents and everyone else who lives in the city will have a say in the future of their respective neighborhoods. Diana Lind is with Next American City, a nonprofit focused on urban planning issues. She says civic engagement is an important part of urban planning, but she says projects like the Roaming Table "can make people feel like they were given a chance to say what they want to say and their comments weren’t taken into account, and that can be dispiriting." So Lind says managing residents' expectations is key. Once the roaming table folds up for good, residents can share their ideas at Detroit Works-sponsored community meetings later this summer, where Pitera and company promise to listen and incorporate the ideas into a master plan for each of Detroit's neighborhood.